From Miles to Mozart: Sound the Bells! Just arrived in my office and have decided to usher in the morning with some brass fanfares. Sound the Bells! 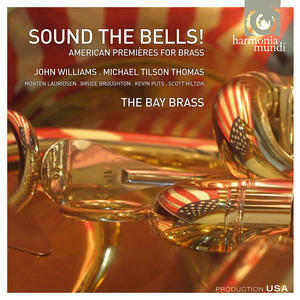 American Premieres for Brass is a recent album from the end of 2011 featuring the Bay Brass, a San Francisco-based ensemble, in a performance of several first recordings of American composers including John Williams, Michael Tilson Thomas, Morten Lauridsen, Bruce Broughton, Kevin Puts, and Scott Hiltzik. I don't normally run out and buy CDs or LPs of brass music, but something about this album -- whether it be the American repertoire, the generally wonderful sound quality of Harmonia Mundi recordings, or maybe just that I don't really own a CD of brass music -- motivated me to pick this one up. Now while I can't say that I listen to this disc all the time, there's an occasion for everything. I'm a morning person, and I happen to find the glorious sound of brass instruments a nice celebratory way to get my work day going. I particularly like the John Williams compositions, which have a similar flavor to his Olympic Fanfare.